that you get to try things you’ve never done before…. 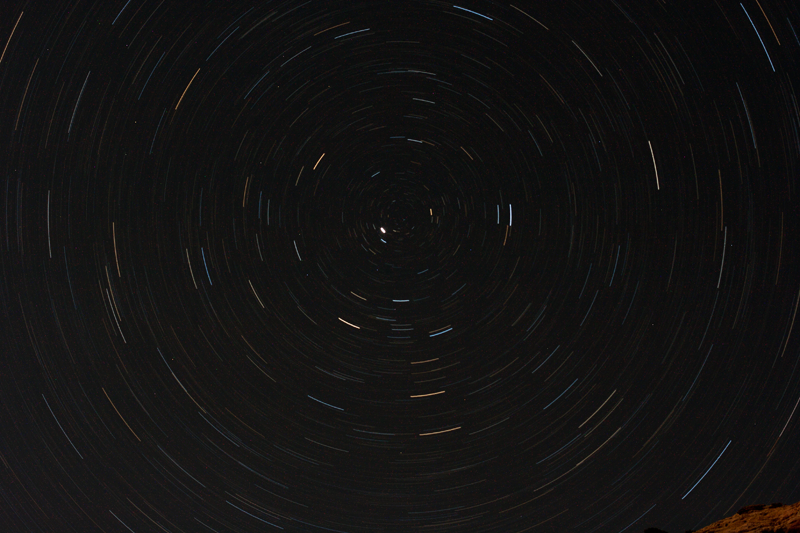 This is a star trail. And while I’ve seen them going across the sky before, I’ve never seen it going around in circles. It’s a bit trippy. Kind of blows your mind just a bit. You can see just a blip of mountain down there in the right corner. I think it was about 11:00 at night when I took this. What you do is focus your camera on the North Star and leave your shutter open for 30 minutes, give or take. It seems really weird to think we’re going around in circles like that. I mean, I know we’re on an axis and spinning and all that, but to see it represented this way? Sooooo weird! Kind of looks like a vortex of some kind. I had used my 50mm lens on this at the recommendation of the teacher–because it is the better lens of the two that I had–but I wished I’d have used my 28-135 instead so I could have gotten more of the mountain in there as a reference point–I would have gotten more sky too. Kass used her wide angle and it looked really cool with the mountain in there. You’d have thought it was daylight, that’s how much detail was there. And I’m fascinated about the different colors of stars there. FYI, Capitol Reef is designated with a International Dark Sky Status. That means, you want to see some stars? This is the place! It has the least light pollution around so all you see is stars! That is so awesome!!!! I would love to have a camera that could do that. Amazing!! Wow I’ll love to be able to capture that. Hopefully one day. Wow! What a photo! Amazing… I need to learn more! Thanks for sharing, Kerri!